These are further divided into 14 sub-districts (nawahi). Deir ez-Zor was the location of Israel's execution of Operation Outside the Box on September 6, 2007. Israel bombed a northern Syrian complex suspected of holding nuclear materials from North Korea. In the course of Syrian Civil War, as the Syrian Army has concentrated its forces on wresting back control of Aleppo, rebels have slowly gained ground in the eastern tribal heartland, aiming to control the country's 200,000 barrel-a-day oil output. In August 2012, units of the FSA targeted the remaining isolated outposts of the Syrian Army forces in north-east Syria, where the FSA control all the main roads. There were said to be only 3 Army outposts left in Deir ez-Zor province countryside and they were under attack. On November 30, 2012, Syrian troops withdrew from Omar oil field, one of the last regime positions east of Deir ez-Zor city near the Iraqi border. This meant that the rebels control the country's major fields. This happened after Syrian troops lost the Conoco gas reserve on November 27. The insurgents took control of an oil field for the first time on November 4 when they overran Al-Ward, the most important in the province. After also losing control of Al-Jofra field also in November, the army controlled not more than five fields, all located to the west of Deir ez-Zor city. Residents in Deir ez-Zor used crude oil for heating and agriculture for lack of fuel On 1 January 2013, it was reported that two thirds of Deir ez-Zor Governorate was under rebel control. ^ "City Population: Syria". Retrieved 19 August 2011. ^ Mahnaimi, Uzi; Baxter, Sarah (2007-09-23). "Israelis 'Israelis seized nuclear material in Syrian raid'". London: The Sunday Times. Retrieved May 1, 2010. ^ "Syrian troops reportedly withdrew from Omar oil field, one of the last regime positions east of Deir Ezzor". Al Jazeera. November 30, 2012. Retrieved November 30, 2012. ^ "أهالي دير الزور يستخدمون النفط الخام كوقود للتدفئة". Al Arabia. 9 December 2012. Retrieved 9 December 2012. ^ "سوريا - أهم المناطق التي سيطر عليها الجيش الحر عام 2012", Al Jazeera, 1 January 2013. ^ Le Point, magazine. "Syrie : des rebelles islamistes repoussent un assaut djihadiste dans l'Est". Le Point.fr. Retrieved 25 October 2014. ^ "Mass Grave of 230 Tribespeople Four in Syria's Deir Ezzor: Monitoring Group". Alakhbar English. Al Akhbar. 18 December 2014. Retrieved 8 February 2015. ^ "Syrian troops capture ISIS stronghold Al-Mayadeen amid major offensive". RT International. Retrieved 30 March 2019. 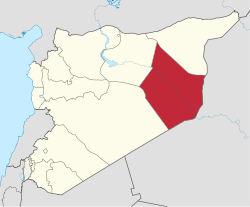 This article about a location in Deir ez-Zor Governorate, Syria is a stub. You can help Wikipedia by expanding it.